Summary: Marketing automation is a dominant theme with banks, as efficiencies are sought. Some tips to start your bank's marketing automation. Studies indicate 1.2B people worldwide do not have proper shelter. As a result, a startup in Austin decided it would work to change that. Using a heavy-duty 3D printer, the startup can "print" a single story, 650 sq ft house out of cement in 12-24 hours. This may seem a little unbelievable, but if all goes well, the company will be building 100 homes in El Salvador next year. Even more interesting perhaps is that a printed house only costs $10k and the startup expects that will eventually come down to $4k. It looks like the tiny home market could have an impressive competitor. 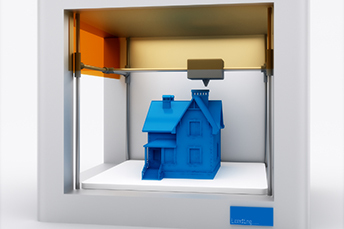 This "printed" house example demonstrates that much can be accomplished with technology these days and that the costs are coming down. Along that same line, marketing automation is a dominant theme with banks, as tight budgets and limited resources force community banks to think differently to catch up with the biggest players. Some banks may think that their current system of manually setting up marketing campaigns works. However, consider that the average time it takes to manually create and deliver new marketing campaigns is over two months vs. automated campaigns that literally take minutes. Start by using existing data. Data and automation create personalized relationships with the customers you already have. You are 14Xs more likely to sell a new product to an existing customer than you are to sell anything to a new customer. It's also often said that it costs 5Xs as much to attract a new customer as it does to keep an existing one. Use existing customer data to send personalized and relevant information, offers, and messages. The more data you can collect from each campaign, the more success you will have with future ones. Use your size as an advantage. Because you have fewer customers than a megabank, you're in a better position to know them. Put customer data in the hands of the staff members who help customers on a regular basis. This can shorten the timeline to find the right product for the right person at the right time. Automate your cross-selling. When Amazon started recommending products based on the premise of "customers who bought this item also bought that one", the company's sales increased by 35%. Suggest new products and offerings that complement the services that a customer is already using. A combination of sorting and audience segmentation, plus the information you already have about your customers, can help you do that better and more efficiently. Coordinate marketing campaigns. Plan for your marketing and front-line staff to coordinate automated marketing campaigns. Most likely, you won't even need additional IT help. By paying the right attention to data, you can help your team analyze customer behavior as it happens. Then, offer products and services, based on that behavior, for good immediate and long-term results. As a community bank, your size and tight customer relationships lets you cultivate nimbleness. You have customer data so you just need to develop an obsessive interest in how your products and services mesh with customer needs. Combine these things with an intuitive, user-friendly marketing automation platform and a great team around it all and you can be unstoppable - even without a 3D printer. Financial Brand reports the average ratio of compliance expenses to non-interest expenses can be up to 8.9% for banks with assets < $100mm vs. 2.9% for banks $1B and $10B. A CNBC survey of economists finds the median respondent expects 3 rate hikes this year and 2 in 2019. Of note, the second most selected answer was 4 rate hikes this year and 3 next year. The SEC said it will pay the largest ever whistleblower awards totaling $83mm to three people who helped them get a $415mm settlement with Bank of America. The bank admitted it had misused customer cash and securities to drive higher profits, risking billions of dollars of customer assets over a 6Y time period. CEOs of the largest US companies have boosted their outlook for Q1 2018 to the highest in 15Ys, following passage of the new tax law. Some 61% plan to hire more staff in the next 6 months vs. 43% in Q4 2017; 68% expect to increase capital investment vs. 49% last quarter and 93% project an increase in sales vs. 76% last quarter. A TimeTrade survey finds people say the reasons they visit a branch in order are: to make a deposit or withdrawal, to use the ATM, to open an account, safe deposit box, notary public and to get a mortgage or home equity loan.